Today was a good day! Ena, of The Henna Studio, stopped by the store to do a henna tattoo on a henna newbie, and that is always fun! She did a lovely medallion on the right foot which looked great next to bright pink pedicured toes with a little gold toe ring. 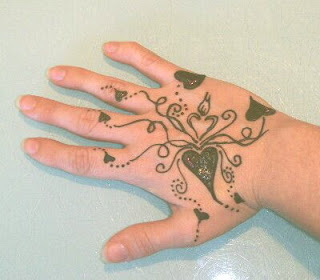 I was lucky enough to have Ena give me a great Valentine henna design on my RIGHT hand. You henna artists out there will appreciate how nice it is to have someone do henna on the hand that you use to draw henna. That hand is always naked! Good news! You can look forward to Saturday henna mehndi appointments here at Beachcombers Bazaar starting in March with Ena and other henna artists on occasion. Here's to much more henna at Beachcombers Bazaar! The Orlando henna scene is losing one of her best loved henna artists. Mariko, of Henna of Soul, has left for Vermont. Mariko will be missed and missed often here in Orlando. The beautiful state of Vermont is about to inherit a rich henna tradition in both talent and energy. I know that Mariko will do well in Vermont, and she'll have a wonderful time bringing henna body art to an area that doesn't have as much henna as we are used to here in Florida. We'll all have to gather our positive energy and send it Mariko's way to help ensure her easy transition and success. Expanding the scope of henna and the blessings, good feelings, and artistic expressions henna conjures is a great thing. We now have a thread that extends all the way up the East Coast connecting us all and binding us closer as henna lovers. Luckily, Mariko has many friends and family here in Orlando, so she will be back for visits! We will be sure to make time for Mariko when she is in town for some henna tattoos! Orlando has a wonderful selection of talented henna artists, but Mariko is still leaving some big shoes to fill. If you are considering sharing your henna art with others, now is the time! Henna is a good thing for everyone and we all need more good things in our life! Join me in wishing Mariko the very best of luck and sending our love to her!